We have to change our mindset and focus on sector coupling – in short, this means that the electricity, heating, transport and industrial sectors must join together to become more environmentally friendly. There is a potential for flexibility thanks to supermarkets. The non-utilized operating capacity of compressors used in supermarket refrigeration systems can act as a heat pump and produce heat from electricity during wind peak production, when connected to a district energy network. These measures could allow EU supermarkets to provide 150 TWh of heat. Refrigeration systems can also be used for demand side management. 500 supermarkets can add 26.5 MW short-term flexibility. 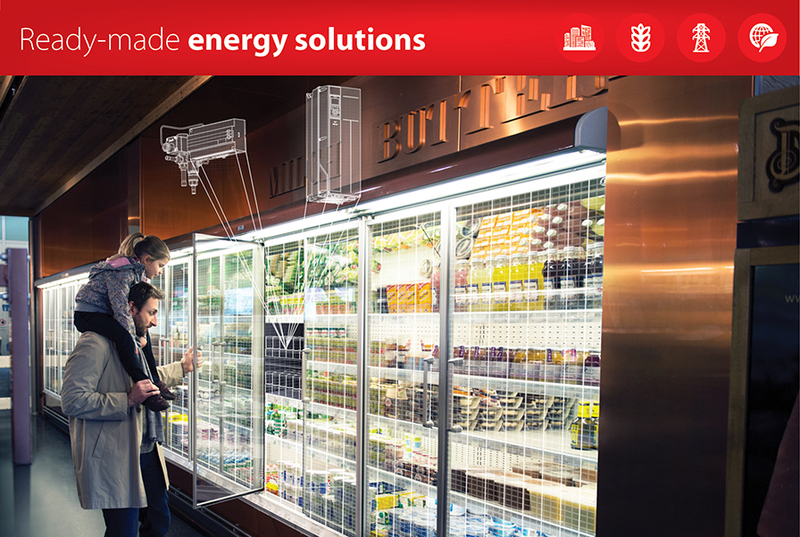 Read more about the impact of smart energy systems on supermarkets here. District heating and cooling can balance the volatility of renewable electricity. During periods of oversupply, excess electricity from, for example, wind can be used to generate heat with large-scale heat pumps and even be stored in the district energy grid. Heat storage is 100 times cheaper than electricity storage! Let us know in the Comments box below if there’s any particular topic you would like us to cover on this blog. We’re happy to tackle complex issues or just provide ‘good to know’ information. And bookmark this page to make sure you get to read all 10 ready-made energy-efficiency solutions. Here are links to the previous posts.